The idea of a round church plan has been an attractive option for architects to recall the feeling of unity. The symbolism of the circle is very old, as was noted in the discussion of the stone circle (3.1.). These stone circles were probably the ‘churches’ of the prehistory. Another circular structure, the tumulus, is just as ancient. These artificial hills were made all over the world as burial monuments (and will be mentioned later in chapter 3.7). The spell of the concentric approach and its cyclic undertone has never left mankind since those early days, because it is strongly associated with (an unconscious form of) higher division thinking. The linear view is, on the other hand, favored in lower division thinking, with an emphasis on duality and hierarchy. It can even be said at this point, that the kernel of the quadralectic philosophy finds its creative origin in two imaginary cyclic units (‘wheels’) touching each other and producing certain values at their point of contact. This line of thinking can be traced back, historically, to the Spanish philosopher Raymond Lull (1232 – 1316). He also built a rather complicated system based on revolving wheels. Nikolaus PEVSNER (1943/1961; p. 134) pointed to the prime function of the medieval church as guidance to the altar. ‘In a completely centralized building no such movement is possible. The building has its full effect only when it is looked at from the one focal point. There the spectator must stand and, by standing there, he becomes himself ‘the measures of all things.’ A round church aimed directly to a holy God rather than a human God. The Holy Sepulchre Church (Anastasis) in Jerusalem is probably the best prototype for the round churches in the Christian world. The circular shape must have been popular in the middle of the fourth century, because it also found its way in the Church of Santa Constanza in Rome (354 AD). This mausoleum was erected by Constantine for his sister Constantia (see fig. 397/398; 3.7. Graves, tombs and mausoleums). The Anastasis (or Resurrection) Church in The Holy Land had a checkered history. The edifice over the Holy Sepulchre was originally built by the Roman Emperor Constantine and dedicated in 336 AD. The building had the shape of a rotunda with a gilded dome of twenty meters in diameter. Extending to the east was a basilica, which embraced Calvary in its south aisle. The building can be seen in the centre of the famous mosaic map of Jerusalem at Madaba (in Jordan), dating from the sixth century. The original buildings were destroyed by fire in 614, during the Persian invasion under Chosroes II. The rebuilding started soon afterwards by abbot Modestus and was finished in 626 with the aid of the Patriarch of Alexandria. An earthquake damaged the church in 746 and the dome of the Anastasis collapsed. Then the army of the Muslims again destroyed the building in 1010. The crusaders built a new basilica with a rotunda at the western end in 1130, much like the original setting by Emperor Constantine. The church was consecrated on July 15, 1146 and became part of the basilica that was completed in 1168. John WILKINSON (1977) described manuscripts of the monk Adomnan, illustrated with pictures made by Arculf on wax tablets, including the Anastasis. Adomnan was the ninth abbot of Iona, the monastery founded by Saint Columba in 563. Adomnan became abbot around 679 and died September 23, 704. He made his name by establishing a law protecting women, children and clergy from injury or participation in war (known as the Cai’n Adomna’n or Law of the Innocents; 697 AD). Adomnan made four church plans, which occur in various manuscripts. Versions of the plans also appeared in manuscripts of Bede’s work ‘De Locis Sanctis’, which were mainly derived from Adomnan. 1. The Church at Jacob’s Well (not in Bede). A cross-shaped building with Jacob’s Well in the center, the place where Jesus conversed with the Samaritan woman (see also p. 56, fig. 37 of this book). 2. The ‘great round church’ at the place of the Ascension was open to the sky in the middle where a circular bronze railing was set up around a patch of dust, which displays the Lord’s footprints. 3. The Great Basilica on Mount Sion had a square form. 4. The Buildings on Golgotha of which the round church, with the burial place of Jesus, called the Anastasis, is probably the most important. The Church is supported on twelve columns, and it has two groups of four doors (fig. 169). Bede’s work was inspired by a devotion to Christianity in which the four-fold – as an expression of a ‘higher’ religious experience – played a major part. Fig. 169 – A sketch of the Church of the Holy Sepulchre and its surroundings as given in a manuscript by the Adamnan (ninth century). The Holy Sepulchre basilica and rotunda as it was rebuilt by the crusaders was again partly destroyed by fire in 1808 and this time the Greek architect Commenes undertook the job to repair the damage, paid for by the Greeks and Armenians. 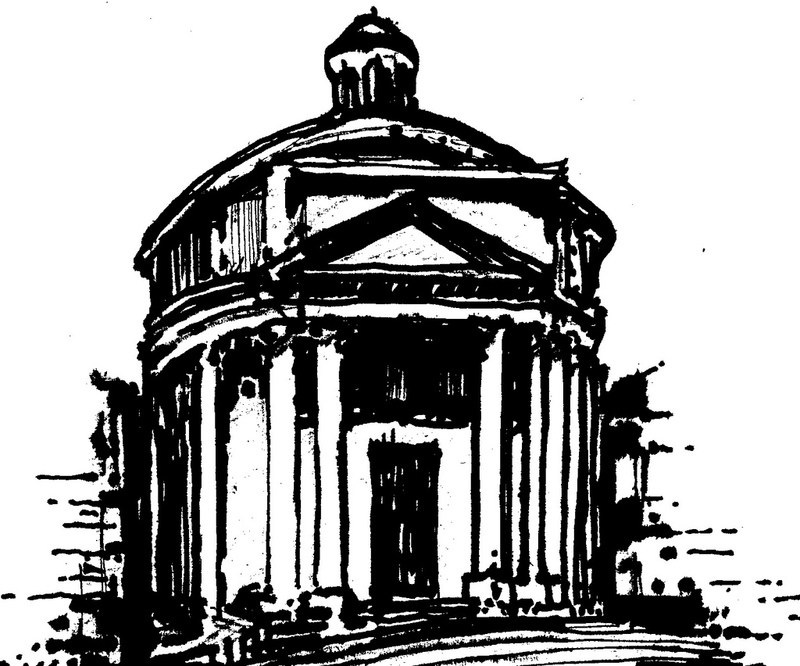 The present (latest) dome of the rotunda was the result of a restoration in 1868 (fig. 170). Any visitor today cannot fail to notice the complicated history of the building, which reflect to a certain extent the ups and downs of Christianity itself. Fig. 170 – This drawing of the Church of the Holy Sepulchre in Jerusalem – with the domed Anastasis to the left – gives the situation after various restorations (VINCENT & ABEL, 1914-1926). The Church of the Holy Sepulchre acted as an example for similar buildings throughout the history of Christian church building. One example is the Church of Veracruz (the True Cross) in Segovia (Spain). This church was built to store a piece of the Holy Cross (Lignum Crucis), as indicated by Pope Honorius III (in 1224). The four-fold theme was used in a creative way: the central area has four openings, the inner circle features twelve corners and three parallel apses are added to the east (fig. 171). Fig. 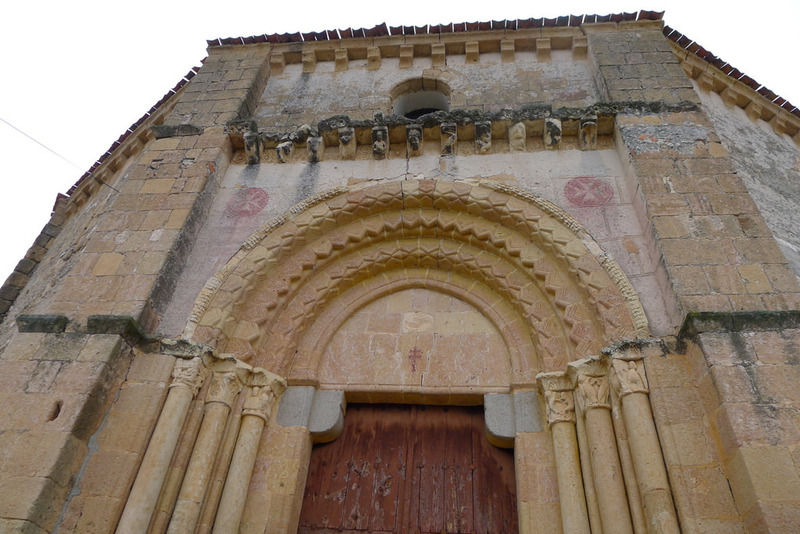 171 – The Romanesque Church of Veracruz near Segovia, south of the town of Zamarramala (Spain) was built by the Order of the Templar (Templar Knights). Presumably, they copied the plan from the Saint Sepulchre of Jerusalem. The circular building (interior) was consecrated on April 13, 1208 and was known as ‘Santo Sepulchro’ until 1226 when a piece of the ‘True Cross’ was given to the church by Pope Honorius III. Church of Veracruz – Segovia (Photo: Marten Kuilman, Febr. 2014). The church was built by the Order of the Templars, a group of militant Christian believers, whose prime goal was to defend the temple in Jerusalem from the infidel. Their roots were in the Christian Crusaders of the early twelfth century, led by two powerful knight organisations: the Knights Hospitallers and the Knights of the Temple. The former started in 1048 as a charitable order, but expanded their purpose in 1118. From helping pilgrims in their hospital in Jerusalem, they became a military order to fight the Muslims. Their name was changed in the ‘Knights of St. John’, after John, son of the King of Cyprus, who aided the Christians. At present the church belongs to the Order of Malta. Entrance of the Church of Veracruz – Segovia (Photo: Marten Kuilman, Febr. 2014). Jan ESKILDSEN (2013, pers comm. 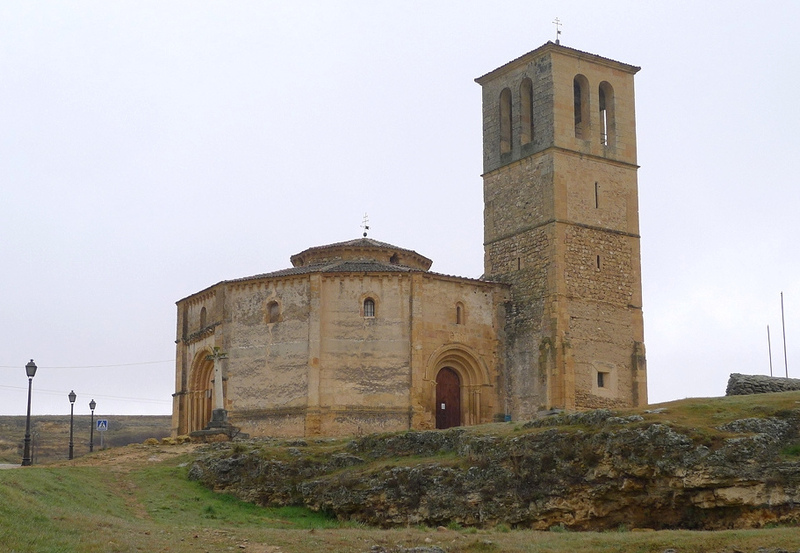 ), from Bornholm (Denmark) commented on the above given text as follows: ‘The Romanesque Church of Veracruz near Segovia in the town of Zamarramala (Southern Spain) WAS NOT built by the Order of the Templar (Templar Knights). The mistake comes from a misinterpretation of the Spanish title of the ‘Order of the Holy Sepulchre’ — in Spanish: ‘Caballeros del Templo del Sepulcro’. Eskildsen certainly has a point here: the church is not circular from the outside. And the relation with the Templars is also open for discussion. It is a good thing that knowledge is critically looked at in the way Jan Eskildsen did. Erling HAAGENSEN (2014, pers comm.) does not agree with Eskildsen point of view. He mentioned Juan Garcia Atienza’s book ‘El Legado Templarios: Una Historia Occulta’ (Editiones Robinbook, 2001; translated as: ‘The Knight Templar in the Golden Age of Spain – Their Hidden History on the Iberian Peninsula‘ (Destinu Books, 2006) dealing with the question. Atienza mentioned a letter by Honorius III, dated May 13, 1224, referring of a shipment (of a relic of the Holy Cross) to Knights Templar at their church ‘in the Septentrion (north) of Segovia’ (p. 251-252). Haagensen is convinced that the Church of Vera Cruz was a Templar church and I am tempted to agree with him. Another important round church is Santo Stefano Rotondo on the Caelian Hill in Rome (fig. 172). The church was built – according to De Rossi in the late nineteenth century – in the fifth century (468 – 483), under Pope Simplicius and completed by John (523/526 AD). The commission was probably done earlier by Emperor Valentianus III (419 – 455 AD), the son of Constantius III and Empress Galla Placidia. The latter is known from her mausoleum near the San Vitale Church (fig. 249) in Ravenna. Fig. 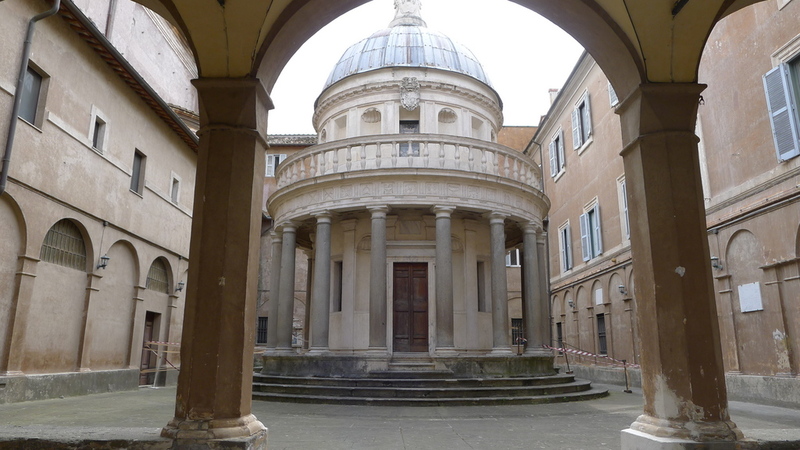 172 – The church of Santo Stefano Rotundo in Rome was built on the remains of a Castra peregrina, the barracks of the peregrini (soldiers detached for special service in Rome from the provincial armies). DAVIES (1952, p. 54), in his book about ‘The Origin and Development of Early Christian Church Architecture’, raised some doubt about the previous- mentioned dating of the building. ‘If this theory is accepted’ he stated, ‘then the building is nothing less than exceptional, for there are no other examples of churches erected specially for congregational use without adequate space being provided at the east end for the sanctuary’. He is more in favor of a transformed pagan building, which may have been a temple of Faunus or Bacchus, ‘or even the meat market of Nero’. 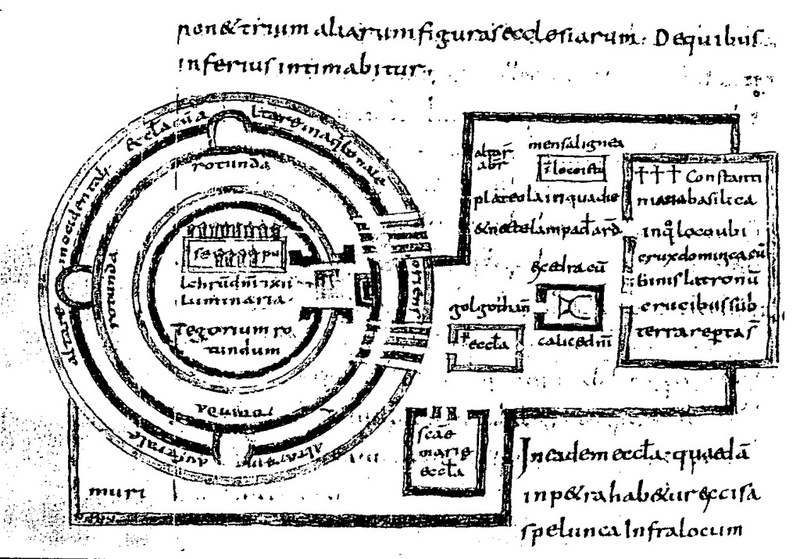 The St Stephen’s Rotunda is the earliest extant Christian Church with a completely circular plan. Two (originally three) concentric rings of columns surrounded a central octagonal altar. The colonnades were altered by Pope Innocent II (1130 – 1143), when a series of transverse arches was introduced to support the roof. The outer wall of the church has a diameter of sixty-four meters, being the largest circular church in existence. The church of Santo Stefano was built on the terrain of a former army barrack (castra peregrina), with an important mithraeum (a place to worship Mithraism) underneath the church. The centrally planned, round way of building found many expressions in later Christian church architecture, but it never became the leading form. Historically, the opposition-rooted spirit of Christianity made a choice for the square, often associated with the cross, as their main ground plan. The history of the (Christian) round-church is related to the round and/or octagonal shaped baptisteries, on the one hand, and circular mausoleums, on the other hand. The events of birth and death are of prime concern of any religious movement. Christianity is no exception. The attention to these crucial moments of visibility is reflected in the symbolism of early church buildings. The form of the baptistery developed from the Roman caldarium, part of the subdivision of the Roman bath. The round burial tomb or mausoleum had a much older pedigree, of which the widely distributed tumulus formed the early beginning. The spark, which ignited the transition from the (Roman) bathhouse to the (Christian) baptistery, was probably first alighted in the Middle East. The Roman-controlled province of Syria lived through a time of great prosperity in the early centuries of the Christian era. Massive building activities in cities, like Antioch, Palmyra, Apamea and Gerasa was extended to the countryside in what is now known as the Dead Cities. The Roman Empire had reached in the second century AD – in a quadralectic interpretation – its early Fourth Quadrant (see fig. 88). Ideas could go beyond the constraints of oppositional thinking and find ways to conquer new fields of understanding. Contemporary architecture was aware of the underlying geometrical (division) notions and their symbolic meaning. The subsequent material execution in that period is recapitulated with the term ‘Hadrian architecture’. The deliberate use of the square and the circle as architectural design tools found its zenith during the lifetime of this enlightened Emperor. Early Christian church building, spreading from its original Jewish source (Jerusalem) and the local centers in Syria (Damascus), Asia Minor and Rome, found in the geometry-controlled designs a source of inspiration. The configurations of the circle and the cross could easily be related to a (new) Christian interpretation, born in unity and division. The rise of Christianity within the Roman Empire has never been explained from a division-thinking point of view. The germination of new organization forms within a unity (culture or otherwise) entering in the Fourth Quadrant (IV) is wide open for further research. The country of Armenia – with the towns of Edschmiadzin and the city of Ani – took the lead as an influential center of early Christian architecture. The formative years were in the fourth to the seventh century. The country developed a unique national style of church building. Perfect examples can be found in the martyr’s churches of Surb Hrpsime, Surb Gajana and Surb Schoghakat, with their remembrance to the pious women, who fled for the persecutions of Emperor Diocletian in the third century. The cathedral of Edschmiadzin, which is a complex building in its present state, was originally built by Gregory the Illuminator over a pagan temple in the fourth century. Nothing remained of this building, since the core of the cathedral goes back to the fifth century. The central area is divided in four parts and supported by pillars, which probably used the layout of the pagan temple. Further additions were made in the seventeenth and eighteenth century, including beautiful frescoes painted by three generations of the Hovnatanjan family. The now-ruined church of Zwarthnotz, also near Edschmiadzin – was built between 642 – 652 under Katholikos Nerses III. 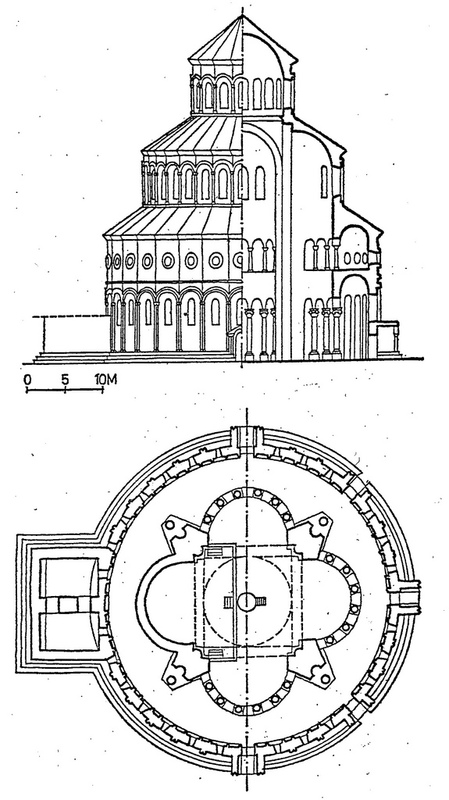 It acted as a blueprint for the architectural synthesis of the circle, cross and square and became a guideline for the further development of Christian architecture (fig. 173). The diameter was fifty-two meters and its height must have been around forty-nine, making it a huge building. This size probably contributed to its destruction in an earthquake in 930 AD, leaving the whole complex in ruins. Fig. 173 – The cathedral of Zwarthnotz, near Edschmiadzin (Armenia) is a masterpiece of Armenian church architecture. An earthquake destroyed the building, but the surviving plans indicate a geometric use of squares and circles in the ground plan. The main features of the Armenian churches can be summarized as follows: 1. The building consisted of solid stone (volcanic tufa), because of the scarcity of wood; 2. The use of vaulted ceilings, because the arc could better distribute the mass of the stone roof to the walls and 3. The application of a dome or cupola, probably as a symbolization of the universe. These characteristics came best together in a centrally planned building. Four periods of Armenian architecture are distinguished in an informative article by Dickran KOUYMJIAN (1992), which reflect not only the fortunes of the local political powers, but also point to the progress of Christianity in a wider (European) framework. 1. The Formative Period lasted from the fourth to the seventh century. The earliest churches in Armenia were basilicas, of which at least seven have survived. They are similar to the Syrian basilicas and their design must have entered Armenia as part of the early Christian expansion to the north. The centrally planned domed churches were built during the sixth and seventh century, although the first examples might be as early as the late fifth century. The tetraconch or quatrefoil church of Agarak, with four salient apses and a dome, is just one of the many cruciform chapels and churches of this period. The aisled tetraconch church of Zvartnots (now destroyed), built in the seventh century, represented the ultimate perfection of the circular plan. The Arab invasion at the end of the seventh century meant the end of this period and two full centuries passed without any significant building activities. 2. The Bagratid Revival – from the ninth to the eleventh century – started with imitating the structures from the formative period, but developed into a new vitality in the latter part of the period. The invasion of the Seljuk Turks after the mid-eleventh century brought this creative period towards a termination. 3. The Flourishing of Monasteries took place during the twelfth and fourteenth century. Large noble families gave Armenian architecture its last spiritual moment, followed by stagnation in the fifteenth and sixteenth century. 4. The Seventeenth Century saw a final national revival under the rule of the Safavid Shahs of Iran. Many older monuments were restored and expanded and some notable buildings were made in the diaspora (like the churches in New Julfa, the Armenian suburb of Isfahan). The now virtually destroyed capital of Ani, on the border of the Arpa Cay – the Harpasus or Barley River – was once the thriving centre of the Bagratid dynasty in the tenth century. The dynasty, derived from a nobility which was Jewish in origin, could provide prosperity to Armenia. Ani became known as the ‘city of a thousand and one churches’. Some twelve of them survive today as hallmarks of a once-prosperous society. They can be dated from the tenth century onwards and reflect, even in their ruined affability, a perfect blend of several types of division-thinking derived from the East and West. The Church of the Holy Savior (in Ani) has the shape of a polygonal drum, with a circular drum on top. The walls have virtually no windows and are relieved with blind arcades and encircling bands of blacker stone. The outside round form hides eight internal semicircular apses, combining the (internal) octagonal with the (external) circularity. These geometrical forms linger, in terms of the symbolism embedded in tetradic architecture. The octagonal – with its association with the apportionment of double four, the element water and (Christian) baptistery – is the highest achievement of four-fold thinking translated in architecture. The circular – related to a limited, but undivided unity with no beginning and end – is the best representation of the First Quadrant (as seen from a Fourth Quadrant). The mental tension on the transition from the Fourth to the First Quadrant – from the visible invisibility (of the multitude) into the single, undivided invisible invisibility – is enormous, because it is at this very place in the communication that the width of circular thinking becomes pressing. Chosen boundaries have to be reconsidered just before they disappear in, what the Greek called the Abyss (the ultimately unknowable boundary between the Fourth and First Quadrant). Another important drum-like building in Ani was the Palace Church of St. Gregory built at the beginning of the eleventh century. The church was an imitation of the cathedral of Zwarthnotz, which had collapsed in an earthquake some hundred years earlier. The outside was composed of three drums, one above the other in a diminishing scale and surmounted by a dome. The inside of the church consisted of a quatrefoil, forming an apse and three open arcades, and surrounded by an ambulatory forming a complete circle. Only the circular floor of the church has survived with the remnants of the piers and broken columns. A wealthy shepherd (or a wealthy man, who became a shepherd) built the so-called ‘Shepherd’s Chapel’ outside the walls of Ani around 1040 (other dating points to the twelfth of the thirteenth century). Its small size might also suggest that it served as a mausoleum, with the lower level perhaps used as a sepulcher and the upper level as an oratory. The drum-like building was almost entirely destroyed by an earthquake in 1966 (fig. 174). Fig. 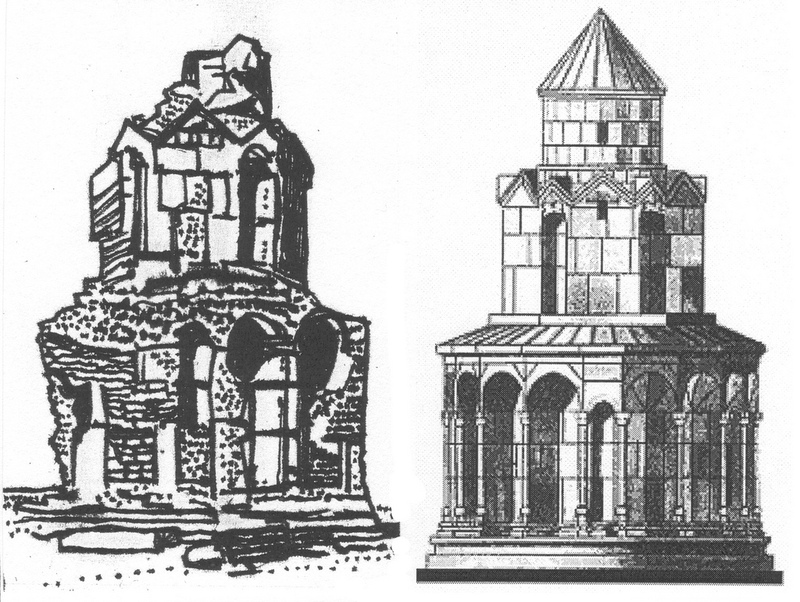 174 – The Church of the Shepherd in Ani (Turkey) is now in ruins (left), but a reconstruction can be made (right) and a complex twelve-pointed star ground plan with six arches can be inferred. The ruins of the church can be seen from the road approaching Ani, but are within an inaccessible military zone. The building is externally divided into three sections and had internally two floors. The total height was around eleven meters and had a diameter of seven meters at its base. Some pointed arches are radiating to a central keystone. These arches bear similarity to the (later) Gothic arch, but can also be related to Persia, where such pointed arches were made of brick. Creative researchers, like Strzygowski and Baltrusaitis, have drawn lines of influences between the eastern Christian church architecture and the Gothic style in Europe. Emigrations, which followed the Turkish conquest of Armenia in the eleventh century, transplanted Armenian (architectural) ideas to Lombardy (Italy). Furthermore, the Crusades of the twelfth century brought the European knights and their entourage in contact with Armenia church architecture in Cilicia (Lesser Armenia) and these findings had, in their view, a catalytic effect on the developments of cathedral building in Europe. The round church of S. George in Thessalonica (Greece) is much older, dating from the fourth century (fig. 175). It is geographically positioned between the formative years of the architecture in Armenia and the ‘classical’ heritage of the Roman Catholic Church. The Rotunda of S. George in Salonika (formerly the mausoleum of Galerius, 305 – 311) takes that same position. 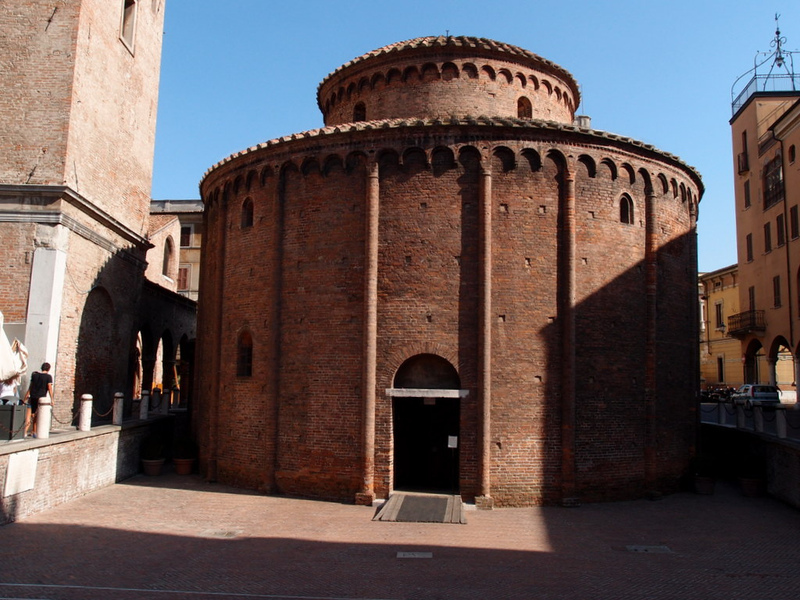 The fifth-century church of S. Lorenzo in Milan, which was later studied by Leonardo da Vinci and Bramante, is just an example of the continuity of the central design in the West. Fig. 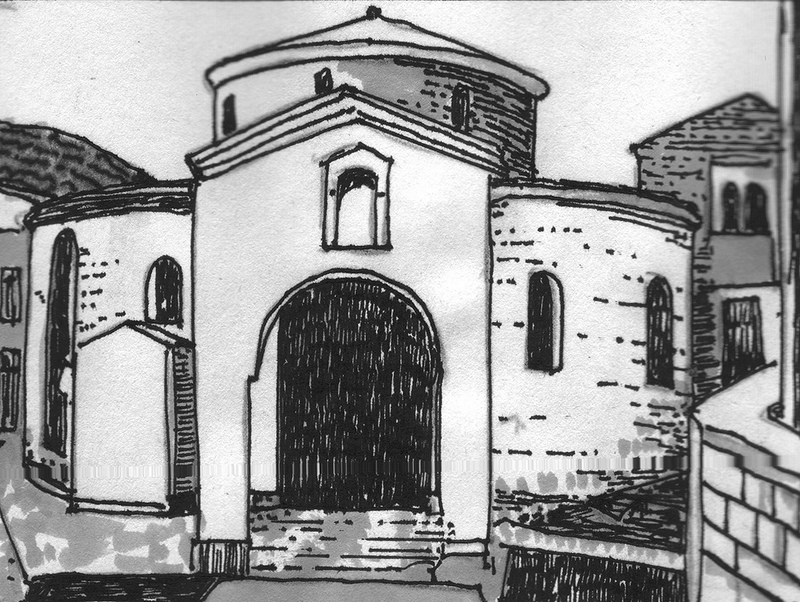 175 – The S. George Church in Thessaloniki (Greece) consists of a ground plan where the round and octagonal were joined together and a projecting sanctuary was built on one side of the circular chamber in order to facilitate public worship. The Santa Maria Maggiore at Nocera (Superiore) near Naples (Italy) – also called ‘la Rotonda’ – was once a baptistery founded in the second half of the sixth century. Later it became the cathedral of Nocera (fig. 176). The diameter is twenty-four meters and its round shape was based on Byzantine churches inspired by Justinian (c. 482 – 565 AD), the great builder of churches and forts. ‘All over the empire the monuments of his wealth and taste were seen in dozen’s churches, halls of justice, monasteries, forts, hospitals and colonnades. The historian Procopius was able to compose a considerable volume entirely on the subject of Justinian’s buildings, and numbers of them survive, some perfect and more in ruins, to witness to the accuracy of the work’ (OMAN, 1892; p. 106). Fig. 176 – The Santa Maria Maggiore church at Nocera (near Naples, Italy) is part of the tradition of round temples and churches within the Roman sphere of influence. The building was conceived as a baptistery, but later became the cathedral of Nocera. 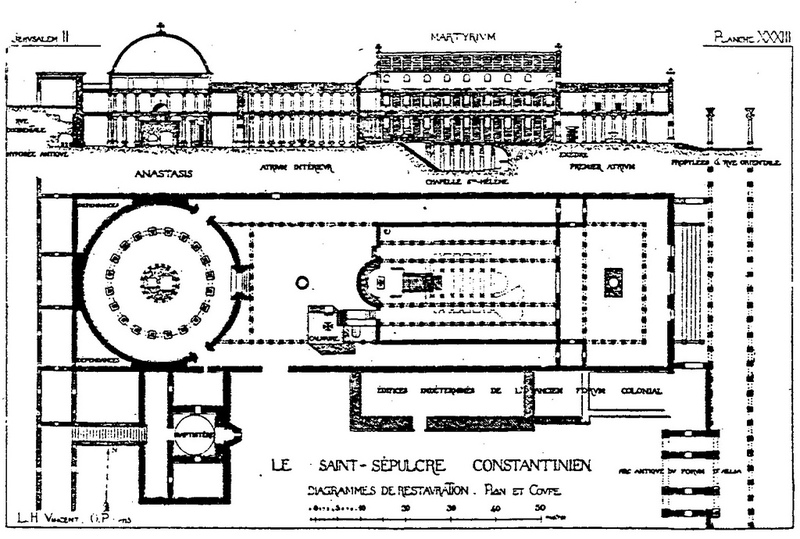 Emperor Justinian promoted strongly the architectonic concept of a cruciform ground plan and a very large dome – like it was applied in the Church of St. Sophia in Constantinople – in the West. This latter building had been burnt twice before Justinian gave the order (in 532) to rebuild the church for a third time. The materials were plundered from the pagan temples in Asia Minor. It has been mentioned earlier that medieval visitors to the Holy Land were impressed by the Holy Sepulchre Church (Anastasis) at Jerusalem, initiated by Constantine the Great between 325 – 335. 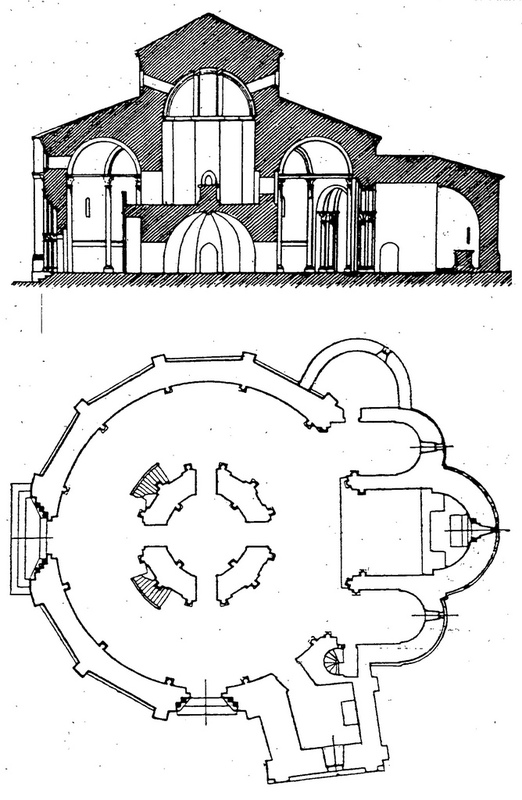 Detailed plans of the Anastasis probably inspired the round church of St Michael in Fulda (Germany, ninth century). 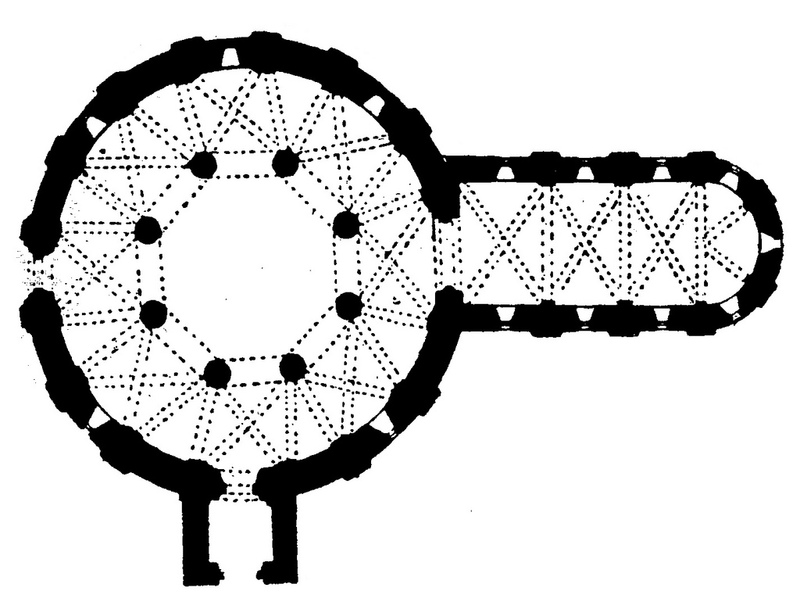 The circular ground plan got a new impulse in the eleventh and twelfth century in such churches as the Busdorfkirche in Paderborn, the Bergkirche in Ruine Krukenburg (1107) near Helmarshausen/Bad Karlshafen (Hessen) and perhaps also the chapel near Drüggelte (UNTERMANN, 1989). Winfried KATHOLING (1999) performed an interesting survey of the places of pagan worship in Central Europe. The enumerative description included round structures, like the Celtic Ringwallanlagen (round earthworks), cromlechs (a circle of menhirs, like Cromlech N. 2 de Peyrarines in the Central Massif of France and near Boitin in Mecklenburg-Vorpommern in Germany) and the before-mentioned Drüggelter Kapelle (nine kilometers south of Soest (Westfalen, Germany), dating from the beginning of the thirteenth century. The small chapel at Drüggelte (ten and a half meters in diameter) has puzzled the cultural historians. The inside of the chapel has twelve columns in the outer circle and two columns plus two brick pillars in the inner circle. A Christian service is hardly possible due to the number of columns. Suggestions have been made, that the polygonal building was either an old pagan place of worship (Heidentempel) or a church of the Cathars (JACOBI-BÜSING, 1964). Furthermore, its resemblance to the third version (between 636 and 1009) of the Holy Sepulchre Church in Jerusalem is noted (and not the fourth and last version, which still exists). The presence of this round/polygonal church in Westfalen, associated with the dualism of the Cathars (Ketzer, heretics) – who formed a considerable contra-movement in the Roman Catholic Church in the twelfth and thirteenth century – warrant further investigation. The Lombardy area in Italy features two beautiful round churches: the San Lorenzo in Mantua (or Mantova, fig. 177) and the San Tomaso in Limine near Almenno San Bartolomeo (KOZOK, 2004, p. 130). Both were possibly built in the eleventh century, i.e. before the First Crusade. They show that the European mind was still aware of the vigorous expression of a circular outlay. The credit goes, in the case of Mantua, to the Roman architectural history, with such spectacular round buildings like the Pantheon and Santo Stefano Rotundo in Rome. Fig. 177 – The rotunda of San Lorenzo (to the left) at the Piazza delle Erbe is part of the medieval centre of Mantua (Mantova) (Photo: Marten Kuilman, 23 Augustus 2011). Information in the church pointed to a ‘brotherhood’ of round churches: Cambridge (UK), Duomo Vecchio in Brescia (Italy), Saint Sepulchre in Neuvy (France) and San Tome in Limine, also known as San Tome in Almenno San Bartolomeo (north west of Bergamo). Notably the round church of Salamanca (San Marcos) in Spain and the Church of Sant’Angelo in Perugia (Italy) were missing in the list. 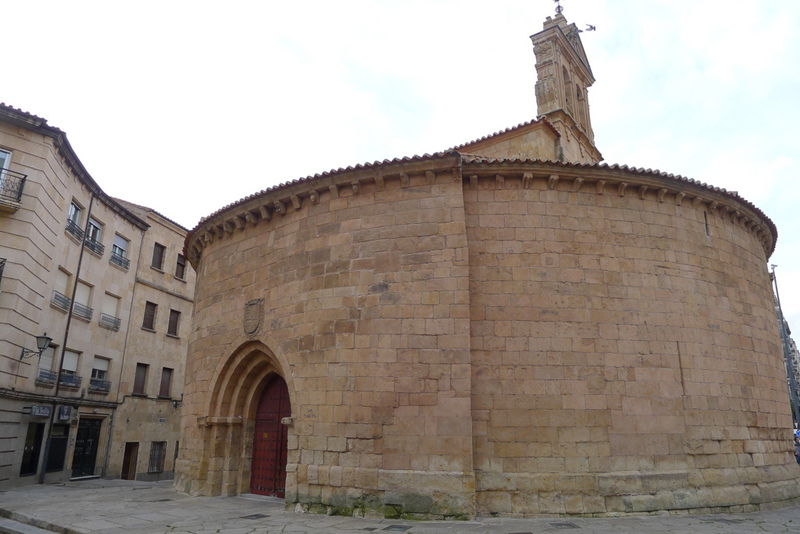 The San Marcos round church in Salamanca (Spain) (Photo: Marten Kuilman, 2014). The rotunda of San Lorenzo in Mantua is situated on the side of the large Torre dell’ Orologia (or Clock Tower, 1473) designed by the mathematician Bartolomeo Manfredi. 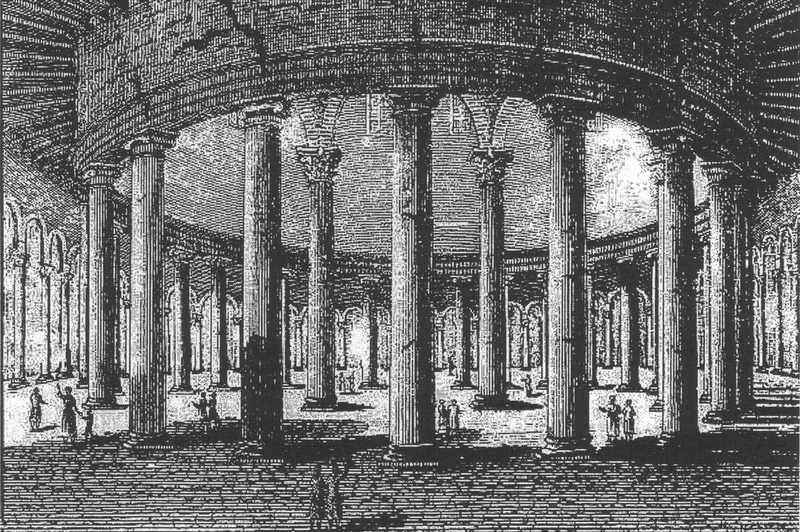 The rotunda was initiated by Matilda of Canossa. This powerful countess (1046 – 1115) became a crucial person in the struggle between the worldly (Emperor Henry IV) and clerical (Pope Gregory VII) power, the so-called War of Investitures. It was in front of her fortress that Henry IV kneeled in the snow and was pardoned by the Pope. The Bishop of Mantua wrote to all church officials in the lower Po valley ‘to be nourished by Matilda’s milk’ and this appeal found a response in such buildings as the Cremona Cathedral (1107 – 1117), the abbey at Nonantola (1121) and the Piacenza Cathedral. The city of Mantua – led for nearly four hundred years (1328 – 1707) by the powerful Gonzaga family – had strong ties with the astrological world. The idea of circularity in church architecture was also tried in England, despite it practical problems with regards to the divisions between clergy and laity and the lack of hierarchy in the approach to the altar. Examples are the round churches in Cambridge (Church of the Holy Sepulchre, fig. 178) and Northampton (the Round, fig. 179), which were small Norman churches, dating from the beginning of the twelfth century. 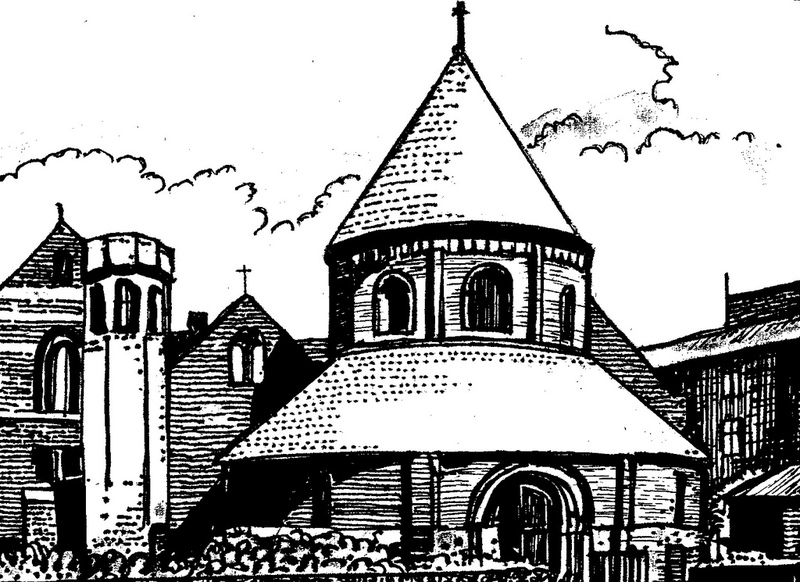 The wayfarer’s chapel in Cambridge became a normal parish church in the thirteenth century. Fig. 178 – The Church of the Holy Sepulchre in Cambridge is a well preserved round church, dating from around 1131. 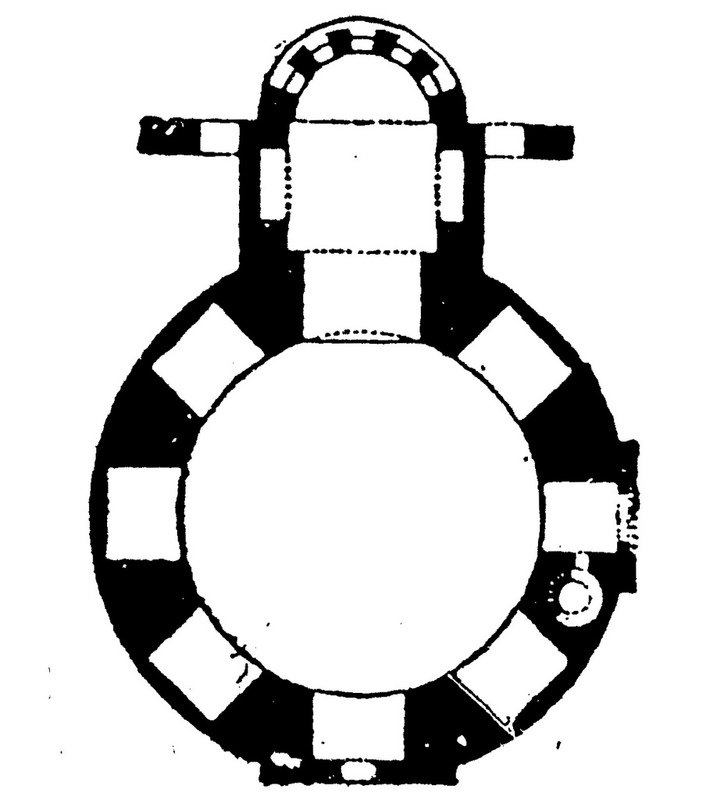 The circular ground plan may be a copy of the church with the same name in Jerusalem. However, a Celtic ’root’ – instigated by Simon de Senlis, who was married with Matilda of Northumberland – cannot be excluded. The round churches might have a relation to the Knights Templar, who returned from the First Crusade in 1097, and were inspired by the rotunda of the Holy Sepulchre in Jerusalem. However, the circular design could also originate from a personal act of commemoration by a local ruler (like Earl Simon I de Senlis or Simon de Saint Liz (about 1068 – 1111), who lived in Normandy and was married to Countess Matilda of Northumberland). The influence of the circular would lead, in the latter case, to Celtic roots rather than to an early-Christian origin, introduced from the Holy Sepulchre Church in Jerusalem after the Crusades. The Temple Church in London (New Temple) is definitively founded by the Templars, just like the first Templar site in Holborn (Old Temple). Other foundations of Templar churches have been found in Bristol, Dover, Aslackby and Temple Bruerne in Lincolnshire and Garway in Herefordshire. Round churches like the Castle Chapel in Ludlow and the excavations in West Thurrock (Essex) are not related to the Knights. Fig. 179 – The Holy Sepulchre Church in Northampton (England) has a circular nave (the Round) an arcade supported on eight columns. The Renaissance, with its renewed interest in all aspects of the classical Roman and Greek architecture, did not really fancy the round design, because of its neutralizing effects in connection with division thinking. The circular strives to unity and equality. These characteristics are associated with the invisible invisibilities of the First Quadrant – and as such related to the act of worship to a single godhead for whom all mankind is the same. The spirit of the Renaissance, on the other hand, was concerned with the visible visibility of the Third Quadrant: using architecture as a plain statement of being. The symbolism of dualistic thinking is drawn towards the linear, to the ever greater possibilities of the ultimate. The great geographical and astrological discoveries around the year 1500 – like the discovery of Americas (by Columbus) and the turning of the earth around the sun (by Copernicus) – are the result of a consequent following of an oppositional thought to its final conclusions and its subsequent ending in a reversal. However, there are always exceptions to the rule. The Tempietto San Pietro in Montorio (Saint Peter on the Golden Hill) near Rome is a Renaissance church following a pure circular design. The small church is situated in the monastery of S. Pietro and was built by Donato Bramante (1444 – 1514) in 1502 (fig. 180). The architect came to Rome around 1500 and Pope Julius II had asked him to design a new St. Peter Cathedral. Soon Bramante earned himself the nickname ‘Il Ruinante’ (the ruiner) because he took his job seriously and destroyed a fourth century basilica. However, in the small church dedicated to St. Peter, he created a building, which ‘is considered by many art historians to be the finest example of Italian High Renaissance architecture’ (HAGER, 1997). Fig. 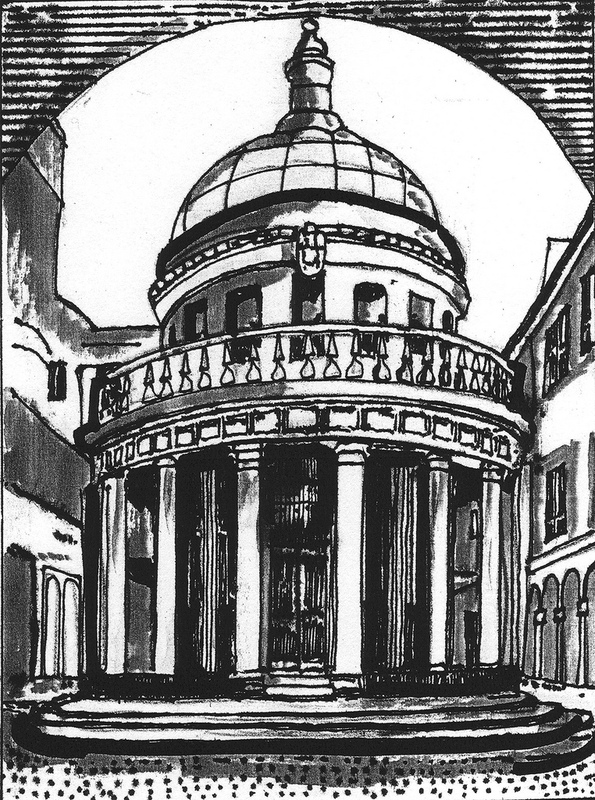 180 – The Tempietto in the Church of S. Pietro in Montorio was built by Bramante in 1502, and is considered by art historians as one of the finest examples of Italian High Renaissance architecture. The Tempietto in San Pietro in Montorio (Photo: Marten Kuilman, May 2014). The Italian architect and art historian Tommaso Temanza (1705 – 1789) took up the challenge to build a centrally planned church in a neo-Palladian style in Venice (fig. 181). The Pantheon in Rome (AD 125) had been his inspiration, with a classical front with pillars and a round church with cupola. The compact construction and geometrical design were in line with the developments towards the end of the (European) Third Quadrant. Fig. 181 – The Church of Santa Maria Maddalena in Venice by Tommaso Temanza was built in 1748. It’s inspiration came from the Pantheon in Rome. The visible visibility of the Third Quadrant of the European cultural history (1200 – 1800) had reached in the Santa Maria Maddalena (in 1748) an apex of its creative possibilities. The situation was very similar to the first quarter of the second century AD when the Pantheon was the pinnacle of ‘Hadrian architecture’. The ultimate boundaries of its restricted setting were reached, and a venture in the fourth part of the Third Quadrant could start into the realms of higher division thinking. This transition zone is of great interest, both in the Roman and European history, for those researchers, who try to understand the underlying and motivating type of division-thinking within a cultural entity. Further round churches, mostly of a younger age, are known from a variety of places all over the world. Their geographical range goes as far north as the Round Church of Nyker on the Danish Isle of Bornholm and the Ophir Round Kirk, the only surviving circular medieval church in Scotland (Orkney Isles, Mainland). To the west is the Old Round Church of Richmond, Vermont and to the east the mid-eighteenth century round church of Füred, at the shores of Lake Balaton (Hungary), designed by Antal Fruhman with the Roman Pantheon as an example. Many more round churches in the world can be mentioned but the allotted space calls for limitation. The cathedral in Brasilia (Catedral Metropolitana), the capital of Brazil, was a creation of the architect Oscar Niemeyer (1907 – 2012), who used the circular design in a complete way by an ‘inversion’ of the dome-shape. The sixteen supporting ribs were bent outwards rather than inwards, giving the visual impression of a bunch of flowers opening up towards the heaven. Their religious symbolism is that of the crown of thorns (fig. 182). Fig. 182 – The Cathedral of Brasilia, the design-built capital of Brazil, has sixteen ribs, which are bending inwards to result in an ‘inverted’ dome. Colored glass covers the space between the ribs and a circular roof carries a cross. The carillon was a gift of the Spanish government and the four bells are named after Columbus’ ships. This same ‘new’ treatment of the circular was applied in the Government buildings of Brasilia (the Palacio do Congresso), which consist of two high-rise rectangular buildings with two truncated balls on either side, one as a dome and the other as a cup. This four-some, placed on an elevated platform, offers a spectacular view – and might qualify for a landmark of architecture. However, from a practical point of view, it is probably not convenient to work as a civil servant on the inside of the twin-tower building, getting little light and looking at each others desk. It seemed that the dome had now (in the second half of the twentieth century) entered a rejuvenation of its traditional function as a roof beaming towards the universe into an inner-directed movement, collecting information of the universe (like a radio telescope). The inversion offered a new direction in design. 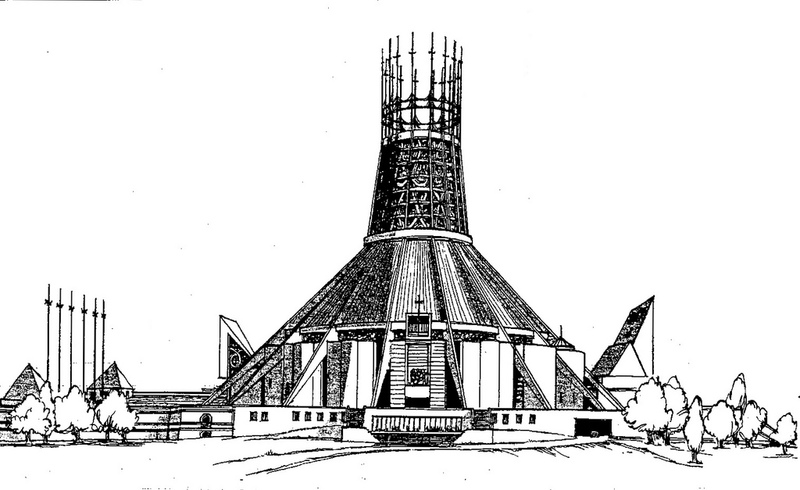 The English architect and town planner Frederick Gibberd (1908 – 1984) took the idea of Niemeyer one step further and came up with ‘the Mersey Funnel’ (or ‘Paddy’s Wigwam’), the nickname of the Metropolitan Cathedral Church of Christ the King in Liverpool (fig. 183). The new cathedral was situated on the site of the Liverpool Workhouse and built between 1962 and 1967. 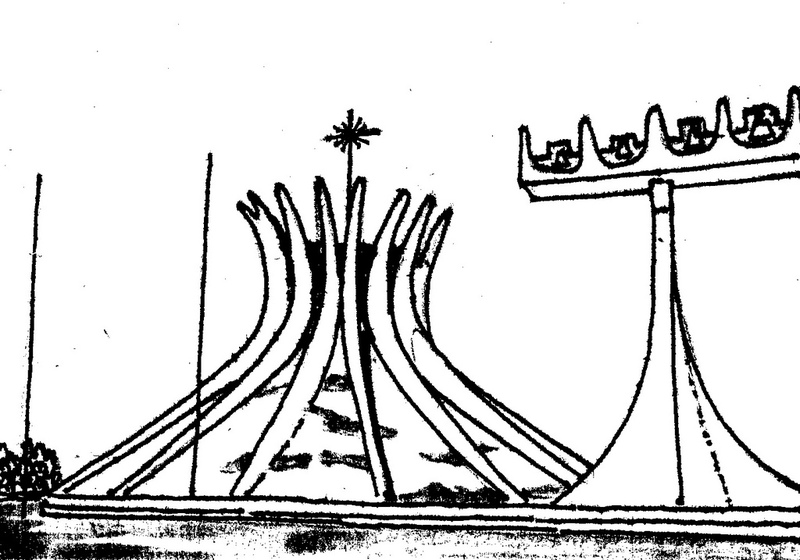 Here are the structural ribs, in the same way as the cathedral of Brasilia, also the symbolism of the crown of thorns, but the design lacks the elegance of the Brasilia building. Fig. 183 – The Metropolitan Cathedral of Christ the King in Liverpool was designed by Sir Frederick Gibberd and consecrated in 1967, some years after the Cathedral of Brasilia. These two churches mark a final reconciliation of the divided circular. The central designs of the Brasilia and Liverpool Cathedrals have touched a new height in the architectonic treatment of the circular in church building. The inversion of the dome into a concave plane is, in terms of spatial architecture, a breakthrough, which had not seen before – and was not even dreamed of by the inventive architects of the Renaissance. These places of worship represent, in their conversion of the (half) circular, the ultimate understanding of the unity of the circle, which can only be achieved in the four-fold way of thinking. Architecture had reached in the middle of the twentieth century – as seen by an observer at the beginning of the twenty-first century – its greatest approach towards itself (see fig. 267). This particular point on the CF-graph of the European cultural history (1950) is called the Second Major Approach (SMA). This marker point indicates the most ‘authentic’ representation of the European spirit in terms of its own definitions. Its earlier counterpart, the First Major Approach (FMA), took place in the middle of the eleventh century (1050), at the point of transition between the Roman(esque) and Gothic architecture. The creative treatment of the square and the circle – as major architectonic elements underlying the design and construction of the churches – had gone full circle between these two important points in the European history (1050 – 1950). The (second) opening-up of the unity of the circle is part of a process, which had at the beginning of the twentieth century when Albert Einstein (1879 – 1955) pointed out the relativity of time and place. The first half of that century was characterized by gruesome wars fought on a worldwide scale and saw mankind struggling to come to terms with the uncertainty of boundaries. Indeed, once the circle is broken, there is no security in the enclosure any more. The conscious presence of a First Quadrant, and its reference to the other quadrants, breaks down the securities of the Third Quadrant. You do not have to publish my comments, send me an email instead, I have more comments. The Knights Templar’s influence has been exaggerated for many years, actually for more than 150 years authors have repeated the false myth, that they preferred the circular form. They might have had 5-6 circular churches or chapels in Britain, but if you look for them elsewhere, you will have a hard job finding any. If you mail me, I will send you more information about sources.